We know New York City is ridiculously expensive, but what about its property values? Because of the city’s confusing “market value” system, true property values are often grossly underestimated. To provide a more accurate look, the data buffs over at Metrocosm have put together these visually telling cartograms of real property values in NYC, substituting land area for total property value. The maps not only compare values in New York with those throughout the rest of the country, but they also look at how property values are concentrated within the five boroughs. The data reveals some striking facts. New York City makes up a whopping 5 percent of the nation’s property value, coming in at $1.5 trillion. When you single out Manhattan’s $733 billion, it could be the 14th most valuable state in the country. The Upper East Side, which occupies less than one square mile, has $96 billion in housing value–more than entire states like New Hampshire, North Dakota, South Dakota, Vermont, Wyoming and Alaska. When looking at the nation, property value is quite concentrated. In fact, roughly half of the total value lies in the top five states–California, New York, Florida, Texas, and Pennsylvania, respectively. But in terms of density–the average property value per square mile–New Jersey takes the top spot, coming in at $130 million per square mile. Connecticut comes in second at $84 million per square mile. 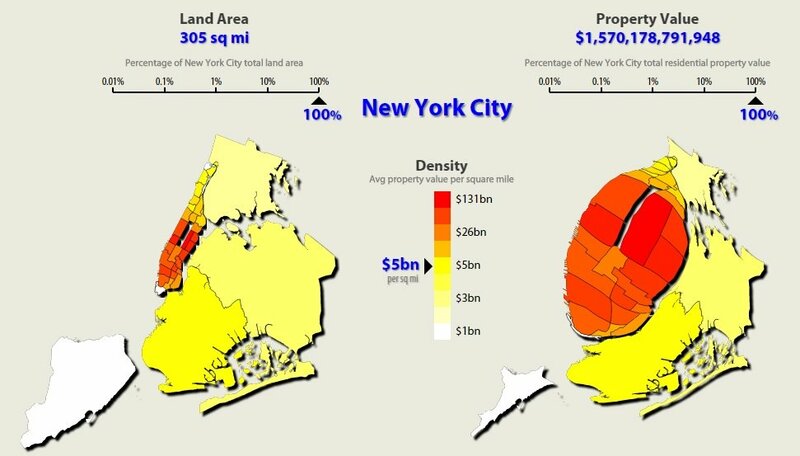 At 305 square miles, New York City makes up only 0.008% of the total land area of the U.S., yet it contains about 5% of the nation’s property value, $1.5tr. Only four states are worth more, one of which is New York State. Manhattan‘s property alone is worth about $733bn, which would make it the 14th most valuable state in the country. Manhattan measures only about 20 square miles, 7.5% of New York City. What I found most striking of all was the value of some Manhattan neighborhoods. The Upper East Side, which occupies less than one square mile, has an astounding $96bn of housing value. That places it above New Hampshire, North Dakota, South Dakota, Vermont, Wyoming, and Alaska. Explore the maps in their interactive form on Metrocosm.